Areas of the source clip darker than the given threshold are blurred and combined with the input clip to give a deep smoky look. Adjust the Darkness, Width, and Threshold parameters to give different types of looks. In the Sapphire Lighting effects submenu. Source: The input clip that determines the glow locations and colors. Background: Optional. The clip to combine the glows with. If no background is given, the Source is also used as the Background. Mask: Optional. If provided, the source glow colors are scaled by this input. A monochrome mask can be used to choose a subset of Source areas that will generate glows. A color mask can be used to selectively adjust the glow colors in different regions. The mask is applied to the source before the glows are generated so it will not clip the resulting glows. Darkness: Default: 0.5, Range: 0 or greater. The magnitude of the dark glows. Dark glows will be generated from locations in the source clip that are darker than this value. A value of 0.1 causes glows at only the darkest areas. A value of 1.0 causes glows on every non-white area. Glow Saturation: Default: 1, Range: -2 to 8. Scales the saturation of the dark colors. Increase for more intense colors. Glow Width: Default: 1, Range: 0 or greater. Scales the glow distance. This and all the width parameters can be adjusted using the Width Widget. Note that a zero glow width still affects the dark areas; set the darkness parameter to zero if you want to pass the Source through unchanged. Width X: Default: 1, Range: 0 or greater. Scales the horizontal glow width. Set to 0 for vertical only. Width Y: Default: 1, Range: 0 or greater. Scales the vertical glow width. Set to 0 for horizontal only. Enables glowing by subpixel widths. Use this for smoother animation of the Width parameters. Result: Shows the final result of combining the glow, source, and background. 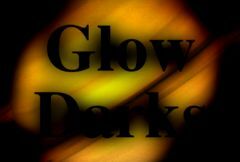 Darks: Outputs the dark areas of the source which will generate the glow. Colors are inverted, so darks will appear bright and vice versa. Glow From Alpha: Default: 0, Range: 0 to 1. Set to 1 to generate glows from the alpha channel of the source input instead of the RGB channels. In this case the glows will not pick up color from the source and will typically be brighter. Values between 0 and 1 interpolate between using the RGB and the Alpha. Glow Under Source: Default: 0, Range: 0 to 1. Set to 1 to composite the Source input over the glows. Source Opacity: Default: 1, Range: 0 to 1. Scales the opacity of the Source input when combined with the glows. This does not affect the generation of the glows themselves. Scales the brightness of the background input clip. Atmosphere gives the effect of the glow shining through a dusty atmosphere and picking up light or getting shadowed. This parameter adjusts the amount, or amplitude, of the atmospheric effect. Zero gives a smooth glow, higher values give more dusty look. Show Glow Width: Check-box, Default: on.